Gum disease occurs when hardened bacteria in the form of calculus, or tartar, builds up around the roots of the teeth, causing the gums to detach from the teeth. This allows more bacteria to accumulate in the pockets that have been formed. 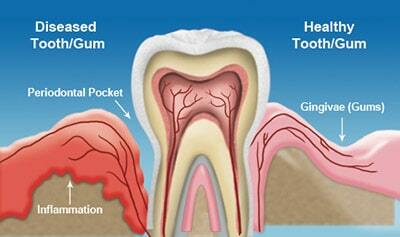 The early stages of gum disease is called gingivitis. Regular professional cleanings with our skilled and gentle hygienist and good personal oral hygiene habits are necessary to prevent gum disease. 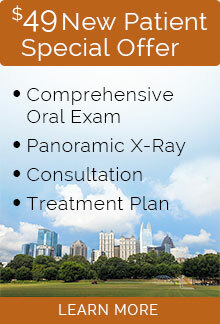 We provide effective treatment for gum disease, from mild to severe. Ultrasonic scalers use sound waves to gently loosen plaque and calculus from the roots of the teeth. Gum disease can be effectively treated with a thorough deep cleaning. We use ultrasonic scalers to loosen the calculus (tartar) and fine hand instruments to remove the remaining calculus and to polish the root surface. Deep cleaning is also known as scaling and root planing. In scaling, our hygienist removes plaque (a sticky film of bacteria) and calculus, which is hardened plaque. Scaling is done to remove build-up from below the gum line. Root planing is done to smooth any rough areas and remove any residual calculus. Smoothing the surface of the tooth root encourages the gums to reattach to the root and discourages plaque build-up. To destroy any remaining bacteria, we use Arestin, an antibiotic which is placed below your gum line. The antibiotic is released over time and will continue to kill any remaining bacteria. If scaling and root planing are not effective enough to treat your infected gums, then Dr. Padolsky will perform flap surgery. During this procedure, the gums are lifted back and the tartar and infection is removed with a high-tech laser. The gum tissue is then placed back so it fits snuggly around the tooth. This procedure reduces the chance of bacteria growing in those areas again. Dr. Padolsky may determine that gum grafting may be necessary to cover the exposed roots of your tooth if enough gum recession has occurred due to gum disease. He will take donor gum tissue from the roof of your mouth (palate) to cover or graft over the tooth with the exposed root. This will result in reduced sensitivity and protect the tooth from decay. All of these procedures can restore your gums to a healthy condition and ultimately save your teeth.